Does Your Baggage Comply With Carry-On Regulations? Why One Bag Carry-On Travel? There are a number of good reasons for a carry-on, one-bag travel strategy that has nothing to do with avoiding baggage fees. You look more competent and confident as a traveler when you aren't struggling with a collection of heavy suitcases. That makes it less likely you'll be a target of crime. You'll find better ground transportation options when you can slip easily into tight corners in subway or bus stations. Have you ever made do without necessities as the airline promised a prompt return of your lost bag? If so, you value stepping onto the plane and off of it with one main bag. This is not hard to accomplish if you take the following steps to heart and learn to fit a one bag strategy into your budget travel plans. It's wise to look at what airlines charge for baggage fees before you set out for the airport. But before you look at baggage fees, look at airfares. 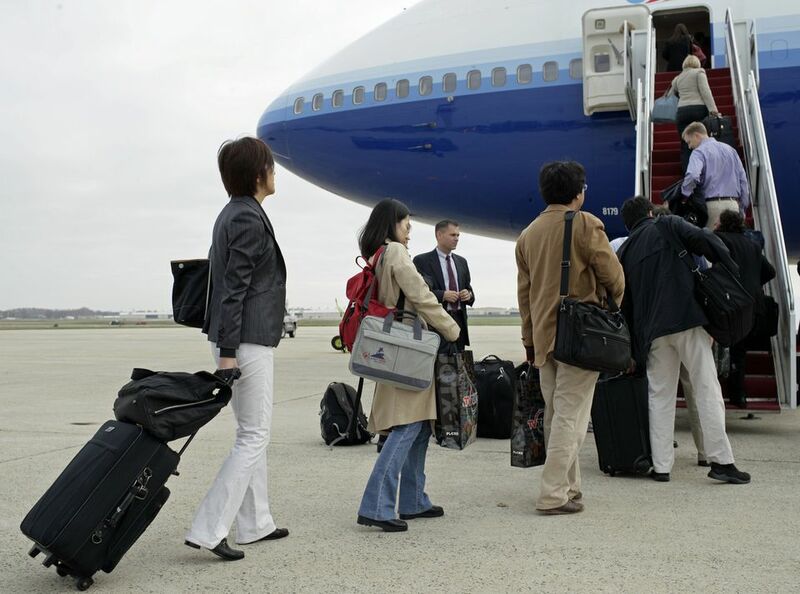 Don't choose a flight because there are no baggage fees or the limits are more friendly than other airlines. Your primary goal as a budget traveler is to get the best airfare without suffering through an inconvenient, multi-segment itinerary. On many low-cost airlines, some novice budget travelers will make the false assumption that baggage fees are a bargain. Reality check: You'll find the baggage restrictions and fees are less friendly on most budget carriers. Compute the total price for you and your bags. But start with the airfare, which is likely to be the big-ticket item. Whether you're looking at budget baggage rules or regulations and fees for major airlines, you'll notice similarities but also many differences. The planes they fly are sometimes identical, but how these various carriers define an acceptable carry-on bag size differs. For example, Air France limits the weight of a carry-on bag to 26 lbs; United allows up to 40 lbs. The same is true for dimensions. Among the airlines, you'll find several inches of variation in acceptable length, width and height for carry-on bags. These standards don't change frequently, but it's a good idea to double-check on the airline website prior to departure. Unfortunately, this useful information isn't always easy to find. The marketing departments don't like to emphasize baggage fees, so you rarely find a link from the home page. Go to the "site map" or perform a word search for "carry-on." Do you own a sturdy carry-on bag that easily fits within the dimensions and yet provides sturdy protection for your belongings? Some budget travelers try to improvise with an oversized gym bag. But when you find yourself in a situation where the bag must go into the cargo hold, the gym bag might not provide enough security or support to prevent problems on arrival. Here are a few features to look for: Wheels, sturdy construction, the ability to lock the contents inside, limited expandability and of course dimensions that are within the most common carry-on guidelines of 22" x 14" x 9." As for brands and models, everyone seems willing to make some suggestions for carry-on bag purchases, but there are quite a few on the market that will serve you well. The best thing about a true carry-on sized bag is that it establishes a firm, accurate baseline for your next step, which is a good packing technique. Can you travel for a week with one carry-on bag? If you find this question outrageous, you might need to re-examine your packing techniques and strategies. Many novice travelers lug around much more than they actually need. When that expandable bag reaches just beyond the carry-on limit, you'll be gate-checking your bag at added expense, or paying fees for overweight luggage. Adopt a "less is more" strategy by packing items that can serve dual purposes. For example, in warm climates, men's bathing trunks might also serve as a pair of shorts. Pack items that can be washed out and dried overnight. Don't skimp on essential medicines or health care supplies, but leave about half of the "essential" clothes at home and travel with a lighter load. Airlines specify the maximum weights for carry-on baggage, but these limits are not always enforced on the major carriers. Budget airlines are another matter. A weigh-in might be required and your carry-on will turn into an expensive checked bag if it is even a few ounces too heavy. Keep the weight down for your carry-on bag. Don't put yourself in the position of struggling to hoist baggage into an overhead compartment. Keep it light enough to make the move quickly. This is an important step for domestic travelers. Many airlines are using smaller planes that are not designed for stowing larger carry-on bags in the cabin. In the picture above, you don't see any overhead bins. This was a Nature Air flight within Costa Rica, and all bags larger than a purse or camera bag will go in the cargo hold on these flights. But many U.S. flights present a similar scenario. For example, flying United from Memphis to Chicago, you might encounter an Embraer RJ145. This is a comfortable plane with 50 passenger seats, but the overhead bins are not large enough to accommodate a rolling suitcase. In this case, you'll need to check your bag at the gate (at no charge) and pick it up immediately after exiting the aircraft. Pack accordingly. Don't put a laptop or other fragile contents in your carry-on until you're sure it will be staying with you in the cabin. Security lines are no place to lug around a large, weighty carry-on bag. But there are plenty of reasons beyond heightened security to stay under the maximum weight and dimension guidelines, well below if possible. Check the baggage regulations for budget airlines carefully. Many budget travelers have seen messages from Southwest Airlines touting the "no baggage fee" policy and wrongly assume that all low-cost carriers go easy on fees for baggage. As noted, budget airlines today have adopted price structures tied to making passengers pay only for the services required. If you require an oversize bag, you are going to pay dearly for the privilege of taking it along. Some (Spirit and Frontier are examples) even charges a fee for using the overhead bins. Their claim: Boarding a plane is more efficient when all the major cargo is stowed outside the cabin.